It feels a little odd to be writing this final regular update for QSO365. It really doesn’t seem like a year ago that it all started and I’m a little relieved to be posting this update, knowing that the project has been a resounding success with not only a QSO made every day of 2011, but a ‘unique’ QSO. I’ve still got my usual monthly statistic post to write and then there will be one more overview with the yearly statistics and then it’s all done. So to kick off – I’ve not run QRSS much recently and so I decided that I should give it another go. I switched my QRSS labs 40m kit on at shortly after midnight on day #364 and was able to find a good trace from the Pensacola Snapper in Florida later in the morning. 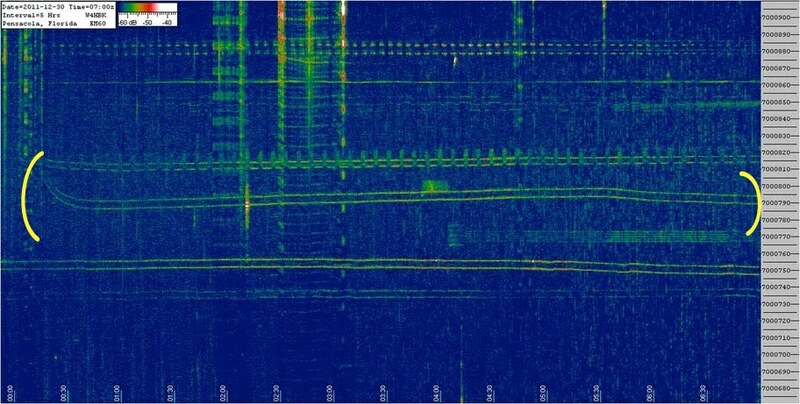 The trace highlighted by the two brackets is my transmission and you can clearly see it from switch on when it warms up and drifts down by 25Hz or so. My signals were readable in Florida up to around 10:00z. It still amazes me how far such a low power signal can travel, the 30m QRSS station we have running at the Martello Tower is regularly heard over the whole planet and it’s running around 100mW. I left my 40m QRSS transmitter on for most of the day so therefore I didn’t use that band at all for QSOs on day #364. I first spoke to EW6DX, Igor on 15m. I’d worked Igor before on 10m and 12m so to add another band, we QSYd to 18MHz for another QSO. After that I spoke to UP20BEW, Alex on 15m and VU2RBI in India on 12m. I called CQ for a while on 10m and worked M0HKB, Kieron who’s not too far from me in Felixstowe. There were lots of band changes today and I next went back to 15m and spoke with HZ1FI, Tom in Saudi Arabia. I then changed back to 10m and spoke to HS0ZIN, Paul in Thailand and RA3DQO, Eugene. I band changed again to 15m and worked UP20LWZ, Jana. One more band change later to 17m to work CT2IOI and then it was back to 12m to talk to CO6LC, Ori and UT/F5RAV, Luc. I ended up the evening by talking to YT3PL, Lui. on 20m. Lui was the very first person I worked this year at just after midnight on the 1st of January so it was quite a coincidence to talk to him again right at the end of the project. Day #365 was a busy day. I really did some of everything on the final day of QSO365, I worked every HF band that I have capabilities for and I managed pretty much all modes that I can comfortably run. I woke up really early (it was just after 06:00) and started off the day on 40m JT65 where I worked EA7GDC, Manuel. I then went back to bed! When I got up properly I first spoke to YO9HP on 20m followed by IK3ABY/P, Stefano on the same band. I moved to 15m and spoke to Z30U, Alec and then managed to get through a pileup to work 7X2ARA/P5 in Algeria. I also worked IZ7DOK, Marco and SV3FUP/M, Aris on the same band. After that I changed to 20m to speak to EA3PT, Jordi and then moved to 15m in order to work ER1VS, Vic. After that I had three QSOs using PSK31 on 20m, I worked 9A4KW, Kiko, UT9LI, Sergio and SP3NGI, Met. I stayed on data and used RTTY to work UA3DDT, Alex and then changed to ROS16 to have a quick QSO with OH3FZQ, Juha. I then dropped onto 40m for a sked with my brother, G4GHU, Terry and after that had a long chat on the same band with G7BXU, Steve in Reading. Keen to work more modes, I called CQ on 10m FM and spoke to George, SV9IOM. I moved to 12m and spoke with A71AM, Saif in Qatar and then worked Pablo, EA3EVL on 17m. I realised that I’d not used 30m yet so changed to that band and saw PA9CC calling CQ using JT65 and he was such a big signal that it was an easy QSO. The next one wasn’t so easy though, it took a while to get through the pileup to talk to KP2/SM4KYN, Anders on the US Virgin Islands on 10m. An easier QSO was with VA3ZDX, Greg on the same band. I knew I wanted to work someone using AM and had tried a few calls on 10m on 29.000MHz earlier with no response. I’d seen a couple of DX Cluster spots for my friend John, G3YPZ using AM on both 10m and 15m so I followed him onto 15m and heard the end of a QSO he was having. The other station QSYd down 5KHz so I was straight there and called him without even setting up the amplifier so I was just running 5 watts. He heard me and so I had a nice QSO on 15m AM using 5w with Dan, W1UR in New Hampshire at a distance of a little over 3,200 miles. I had to put the amplifier on for the next QSO though as there was a massive pileup. I finally got through to work KG2A/VP2, Kei in Bermuda for a new DXCC entity on 15m. After that I had another sked, this time it was a very easy one – I worked my son, David, M6DHU on 15m for the first time. I then switched to 20m and had a couple of contacts, I worked IW7DKS, Gil and 7Z1SJ, Suli in Saudi Arabia. I finished the day and therefore the QSO365 project by working K6YRA, Allen on 17m. This entry was posted in AM, Amateur radio, Data, FM, HF, JT65, New DXCC, PSK, QRSS, QSO365, RTTY, SSB and tagged Hans Summers, QRSS, QSO365. Bookmark the permalink. Happy New Year & Congratulations Keith. Congratulations on QSO365, Keith. I think it was a really excellent project. Well done and I’m glad I was in the log a couple of times!